A recent Gallup poll that shows older Americans dramatically shifted their political support from Democrats to Republicans supports a trend the Democracy Campaign has seen involving campaign contributions by retirees. The Gallup poll showed Americans aged 65 and older moved from reliably Democratic supporters to Republicans supporters between 1992 and 2012. The Gallup story cites race as a primary factor because older Americans are predominantly non-Hispanic whites while younger age groups of Americans are more racially diverse and tend to support Democrats. Whatever the reason for the shift, Gallup's contention that yesterday's Democrats support today's Republicans jibes with a Democracy Campaign finding in 2011. A review of campaign contributions from retirees to candidates for governor and the legislature from 1993 through 2010 showed parity between Republican and Democratic candidates early on, and then a sharp shift to Republican candidates since the 2006 election cycle. Retirees contributed about $1.5 million to Republican candidates and $1.2 million to Democrats between 1993 and 2002. 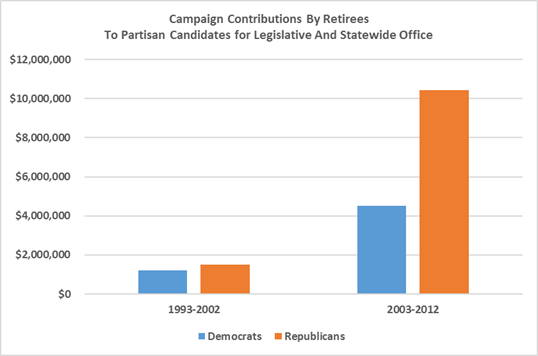 But from 2003 to 2012 retiree contributions jumped to $10.4 million to Republicans compared to $4.5 million to Democratic candidates for statewide office and the legislature. Elected officials are supposed to be faithful to the people. Instead, many if not most of them are cheating on us. They are carrying on an affair with wealthy political donors, special interest groups and the lobbyists who represent them. They shower gifts on these mistresses, all the while neglecting the wishes and needs of the people they vowed to serve. Like conventional philanderers, political adulterers go to great lengths to cover up their infidelity. Here in Wisconsin, the majority leader in the state Senate is now proposing to cement in state law a loophole allowing special interests and lobbying groups to conceal from the public who supplies the money they use to influence elections. The Senate's second-in-command, the assistant majority leader, has been pushing another scheme to blind the public to the financial interests of nearly all political donors. Meanwhile, they are doubling down on the hanky panky. Literally. The Assembly already voted on a bipartisan basis to approve legislation that would double Wisconsin's limits on political donations. Senators are hoping no one will notice as they continue to flirt with the idea of ratifying the Assembly's action and sending it along to the governor for his signature. The Senate majority leader also wants lobbyists to be able to hand out checks year-round. Take one step outside the Capitol and you find people of every political stripe in agreement that there is too much money in politics. Go inside the Capitol, and there is a bipartisan consensus that there's not enough. 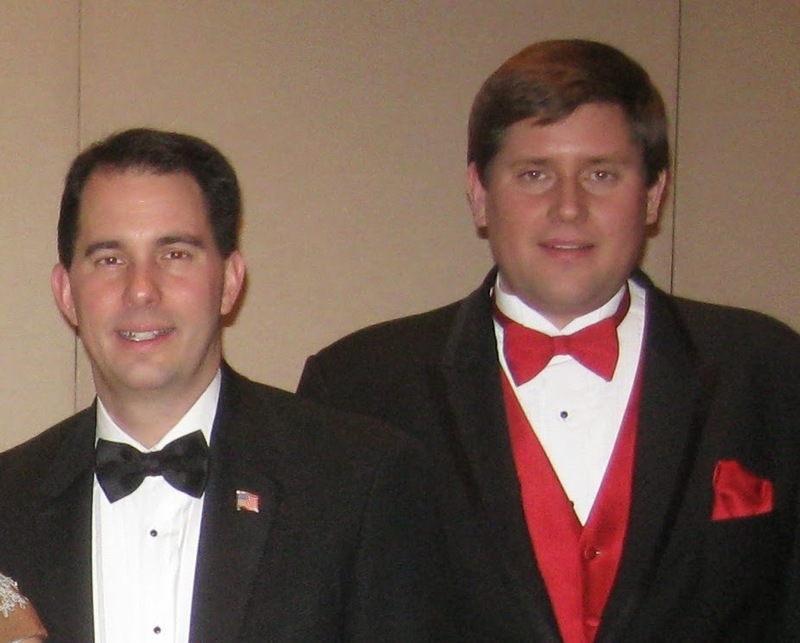 Most people may be unaware that in 2012 a grand total of 243 donors – including 149 from out of state – reached Wisconsin’s $10,000 annual limit on campaign contributions. That tiny group of donors whose ability to influence lawmakers would be doubled is equal to four one-thousandth of 1% of Wisconsin’s population. But most voters are instinctively aware that their elected representatives are sneaking around on them. They have a sixth sense for adultery. For their part, the politicians know they are betraying our trust and obviously fear having their infidelity exposed. Otherwise they would not be trying so hard to keep their affairs a secret. They are fooling themselves. Their illicit activity is an open secret. Voters can tell when they are being two-timed.